UPSC 2015 Special Class Railway Apprentices Exam (SCRA), 2015 Exam paper – U.P.S.C. Download Free Online Question Paper of General Ability. General Ability Test 2015 UPSC free sample question papers of (Special Class Railway Apprentices Exam, 2015) are issued by Union Public Service Commission (U.P.S.C.) 2015. General Ability Test 2015 UPSC syllabus for Special Class Railway Apprentices Exam, 2015 Fill in the Blanks-10 marks, Synonyms-12 marks, Antonyms-9 marks, Sentence Improvement-10 marks, Spotting Errors-10 marks , Comprehension-10 marks , Restructuring Passage-10 marks , Selecting Words- 11 marks , General Knowledge- 60 marks and UPSC important question bank. The previous year UPSC old question papers and prelims 2014-2015 question paper and to upgrade your UPSC entrance exam results of 2016 practice the UPSC exam papers of 2015 and General English, General Studies, Last 10 years Question Paper and 2015 and online model UPSC question papers with answers of SCRA Exam 2015 is available in the attached sheet for students and teachers. UPSC 2015 Special Class Railway Apprentices Exam (SCRA), 2015 Exam paper – U.P.S.C. Download Free Online Question Paper of Physical Sciences. Physical Sciences Test 2015 UPSC free sample question papers of (Special Class Railway Apprentices Exam, 2015) are issued by Union Public Service Commission (U.P.S.C.) 2015.Physical Sciences Test 2015 UPSC syllabus for Special Class Railway Apprentices Exam (SCRA), 2015 Physics, Chemistry, Physical Chemistry, Inorganic Chemistry, Organic Chemistry and UPSC important question bank. The previous year UPSC old question papers and prelims 2014-2015 question paper and to upgrade your UPSC entrance exam results of 2016 practice the UPSC exam papers of 2015 and Physical Sciences, Last 10 years Question Paper and 2015 and online model UPSC question papers with answers of SCRA Exam 2015 is available in the attached sheet for students and teachers. UPSC 2015 Special Class Railway Apprentices Exam (SCRA), 2015 Exam paper – U.P.S.C. Download Free Online Question Paper of Mathematics. Mathematics Test 2015 UPSC free sample question papers of (Special Class Railway Apprentices Exam, 2015) are issued by Union Public Service Commission (U.P.S.C.) 2015. Maths Test 2015 UPSC syllabus for Special Class Railway Apprentices Exam (SCRA), 2015 Algebra,Complex numbers,Binary system, Quadratic equations, Permutation and Combination, Binomial theorem,Matrices and Determinants , Trigonometry, Analytic Geometry (Two Dimensions), Differential Calculus , Integral Calculus and Differential equations, Vectors and its Applications, Statistics and Probability and UPSC important question bank. The previous year UPSC old question papers and prelims 2014-2015 question paper and to upgrade your UPSC entrance exam results of 2016 practice the UPSC exam papers of 2015 and Mathematics, Last 10 years Question Paper and 2015 and online model UPSC question papers with answers of SCRA Exam 2015 is available in the attached sheet for students and teachers. 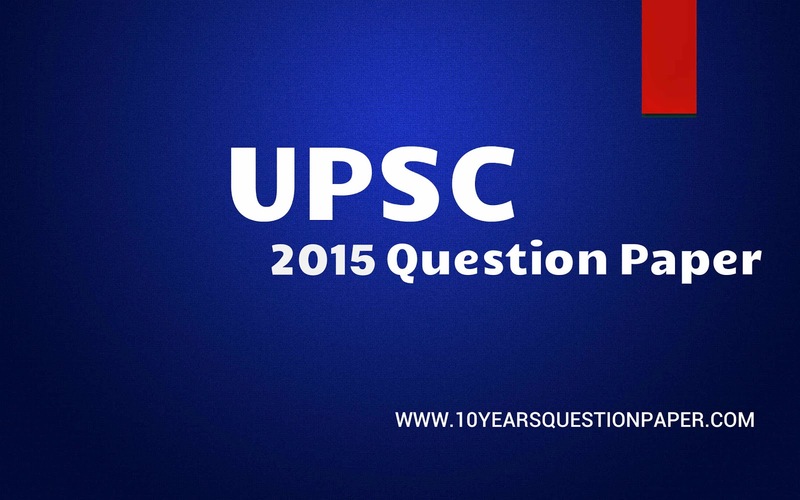 UPSC 2015 Combined Defence Services Exam - I (CDS), 2015 Exam paper – U.P.S.C. Download Free Online Question Paper of English. English Test 2015 UPSC free sample question papers of (Combined Defence Services Exam - I (CDS), 2015) are issued by Union Public Service Commission (U.P.S.C.) 2015. English Test 2015 UPSC syllabus for Combined Defence Services Exam - I (CDS), 2015 Antonyms, Synonyms, Reading Comprehension, Para Jumbles, Jumbled Sentences, Error Spotting, Sentence Correction and Fill in the Blank and UPSC important question bank. The previous year UPSC old question papers and prelims 2014-2015 question paper and to upgrade your UPSC entrance exam results of 2016 practice the UPSC exam papers of 2015 and English, Last 10 years Question Paper and 2015 and online model UPSC question papers with answers of CDS Exam 2015 is available in the attached sheet for students and teachers. UPSC 2015 Combined Defence Services Exam - I (CDS), 2015 Exam paper – U.P.S.C. Download Free Online Question Paper of General Knowledge. General Knowledge GK 2015 UPSC free sample question papers of (Combined Defence Services Exam - I (CDS), 2015) are issued by Union Public Service Commission (U.P.S.C.) 2015. General Knowledge Test 2015 UPSC syllabus for Combined Defence Services Exam - I (CDS), 2015 History of India and Geography of a nature, General Knowledge including knowledge of current events, everyday observation and experience in scientific aspects and UPSC important question bank. The previous year UPSC old question papers and prelims 2014-2015 question paper and to upgrade your UPSC entrance exam results of 2016 practice the UPSC exam papers of 2015 and General Knowledge , Last 10 years Question Paper and 2015 and online model UPSC question papers with answers of CDS Exam 2015 is available in the attached sheet for students and teachers. UPSC 2015 Combined Defence Services Exam - I (CDS), 2015 Exam paper – U.P.S.C. Download Free Online Question Paper of Elementary Mathematics. Elementary Mathematics 2015 UPSC free sample question papers of (Combined Defence Services Exam - I (CDS), 2015) are issued by Union Public Service Commission (U.P.S.C.) 2015. Elementary Mathematics Test 2015 UPSC syllabus for Combined Defence Services Exam - I (CDS), 2015 Arithmetic , Algebra, Trigonometry, Geometry, Mensuration, Statistics and UPSC important question bank. The previous year UPSC old question papers and prelims 2014-2015 question paper and to upgrade your UPSC entrance exam results of 2016 practice the UPSC exam papers of 2015 and Elementary Mathematics, Last 10 years Question Paper and 2015 and online model UPSC question papers with answers of CDS Exam 2015 is available in the attached sheet for students and teachers. UPSC 2015 ENGINEERING SERVICES EXAMINATION, 2015 Exam paper – U.P.S.C. Download Free Online Question Paper of Civil Engineering Paper- 1 (IES). Civil Engineering Paper 2015 UPSC free sample question papers of (ENGINEERING SERVICES EXAMINATION, 2015) are issued by Union Public Service Commission (U.P.S.C.) 2015. Civil Engineering (IES) Test 2015 UPSC syllabus for ENGINEERING SERVICES EXAMINATION, 2015 BUILDING MATERIALS, SOLID MECHANICS , STRUCTURAL ANALYSIS, DESIGN OF STEEL STRUCTURES, DESIGN OF CONCRETE AND MASONRY STRUCTURES, CONSTRUCTION PRACTICE, PLANNING AND MANAGEMENT and UPSC important question bank. The previous year UPSC old question papers and prelims 2014-2015 question paper and to upgrade your UPSC entrance exam results of 2016 practice the UPSC exam papers of 2015 and Civil Engineering (IES) paper, Last 10 years Question Paper and 2015 and online model UPSC question papers with answers of Exam 2015 is available in the attached sheet for students and teachers. UPSC 2015 ENGINEERING SERVICES EXAMINATION, 2015 Exam paper – U.P.S.C. Download Free Online Question Paper of Civil Engineering Paper- 2 (IES). Civil Engineering Paper -II 2015 UPSC free sample question papers of (ENGINEERING SERVICES EXAMINATION, 2015) are issued by Union Public Service Commission (U.P.S.C.) 2015. Civil Engineering (IES) Test 2015 UPSC syllabus for ENGINEERING SERVICES EXAMINATION, 2015 FLUID MECHANICS, OPEN CHANNEL FLOW, PIPE FLOW, HYDRAULIC MACHINES AND HYDROPOWER , HYDROLOGY ,WATER RESOURCES ENGINEERING, ENVIRONMENTAL ENGINEERING, WATER SUPPLY ENGINEERING, WASTE WATER ENGINEERING, SOLID WASTE MANAGEMENT, AIR AND NOISE POLLUTION AND ECOLOGY, SOIL MECHANICS, FOUNDATION ENGINEERING, SURVEYING, TRANSPORTATION ENGINEERING and UPSC important question bank. The previous year UPSC old question papers and prelims 2014-2015 question paper and to upgrade your UPSC entrance exam results of 2016 practice the UPSC exam papers of 2015 and Civil Engineering (IES) paper, Last 10 years Question Paper and 2015 and online model UPSC question papers with answers of Exam 2015 is available in the attached sheet for students and teachers.